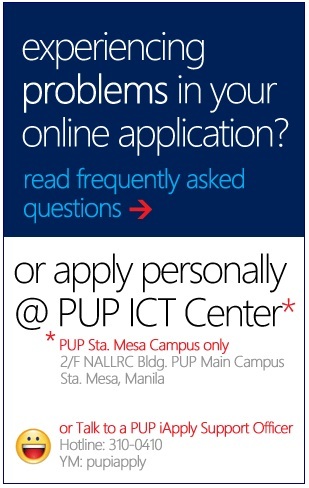 Are you confused with the online application for the PUPCET? Or do you have a lot of questions and you don't who to approach for answers? 1. PUPCET Online Application is Now Open – This article contains information on the requirements for PUPCET, the fees that should pay, claiming the test permit and the contact details for PUP Admissions and Registration Office. 2. Tips for PUPCET and Reminders for PUPCET Examinees – These two articles will be useful for you because they contain tips that you can follow before and during the exam. Read these articles once you are sure that you will be taking the PUPCET. What if you have other questions that have no answer in the articles that I posted? The solution to that is to ask your questions to a PUP iApply Support Officer. You can contact the support officer via the iApply hotline: 310-0410. You can also contact them via Yahoo! Messenger: pupiapply. Don't hesitate to use these resources that I provided you. Answers to your PUPCET questions are just a few press of buttons away. Or you can ask me your questions by leaving a comment. Wala pang announcement ang PUP tungkol sa susunod na PUPCET. Abang-abang na lang po.